With icy and snowy conditions in the winter, keeping fit safely can be challenging, due to the risks inherent in venturing outdoors. Some of the physical challenges we face in the winter include the consequences of missed workouts, walking on icy conditions, and shoveling snow. Most of these challenges have two things in common, however: the need for centre of gravity training, and the need for core and shoulder strength and stability training. Missed workouts: Bad weather means we are often homebound and not moving as much as usual. Sitting too much can result in poor posture, weaker core muscles, and vulnerability to spinal issues such as herniated discs. You can train your posture by standing against the wall so that your spine is straight, your shoulders are down and your head is straight. Breathe deeply into the diaphragm and imagine a string pulling your spine straight up from the top of your head. If you can tolerate lying on the floor in Savasana, this is another way to use a straight surface to train your posture. Walking on slippery snow or ice: While it is always best to try to avoid walking on a dangerous surface, if you find yourself on slippery terrain, it is best to walk like a penguin rather than a human, until you are on more solid ground. When walking, we split our stride so that we support our weight with our legs at an angle that is not perpendicular to the ground. Thus, our center of gravity is not in an optimal position in the split stride, and this can be riskier on a slippery surface. Thus, it is better to take smaller steps and keep your center of gravity over your front leg when walking in winter conditions. 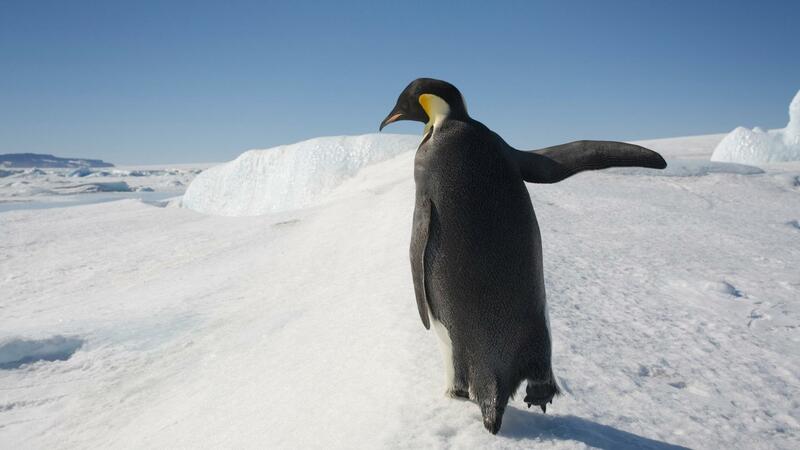 The penguin’s walk is an example of the ideal way to move in treacherous conditions by keeping your limbs in closer than usual, and taking smaller, shuffling steps. Train your core to brace when walking by keeping your posture straight, tighten your mid-section (as if bracing for a sneeze or cough without actually doing it) and breathe normally using your diaphragm. Winterize your body with shoulder and core stabilization: Many of the aforementioned activities require shoulder and core stability. The modified plank exercise is a great way to build strength and stability in these areas. You can begin with your palms flat on a wall and walk your legs away from the wall until you are on your toes and feeling tension in your mid-section. Practice posture and core bracing with a straight spine, while breathing normally, holding the position. Over time you can proceed to a more declined surface, such as the back of a heavy and stable sofa. Eventually you may be able to move to a lower surface (chair, ottoman or bed) and finally to the floor. If your hands and wrists are not able to hold your weight, try using push up bars or dumbbells placed on the floor, which put the wrists in a neutral position. You can also place your weight on your knuckles rather than your wrists. If you find that a floor plank is too challenging, go back to an earlier progression (i.e. chair) until your shoulders and core are stable enough to go lower.